Thank you for making an enquiry. Your message has been received and we will get back to you shortly. Long renowned as a tourism precinct that serves up a smorgasbord of events, Darling Harbour is set to feature a jam-packed line-up of exciting entertainment over the coming months. It’s an ever-changing array of activities that is set to delight the kids and adults alike. From music icons to maritime adventure, here’s eight unmissable Darling Harbour events. As the creator of some of the past century’s most iconic songs, Bob Dylan has been hailed as a poet and music legend alike. On August 18 he graces the Sydney International Convention Centre for one night only, performing a songbook that spans six decades. From seminal classic like ‘Blowin’ in the Wind’ to ‘Like a Rolling Stone’, ‘Tangled Up in Blue’ and ‘Knockin’ on Heaven’s Door’, Bob Dylan has a repertoire that includes some of the most socially, politically and culturally important songs in modern music. In an experience that’s set to delight the young and the young at heart, Madam Tussaud’s will be serving up some serious justice until December 31. This action-packed experience sees all the Justice League heroes in attendance, with a host of interactive activities to put visitors through their paces. Come face-to-face with your favourite Justice League heroes in an action-packed adventure unlike any other. Star alongside Justice League’s Gal Gadot as Wonder Woman, Henry Cavill as Superman, Ben Affleck as Batman, and Ezra Miller as The Flash as they fight to save the world from Lex Luthor’s evil corporation, LexCorp. Help Superman lift a REAL helicopter back into the sky as onlookers cheer from the streets below. Summon Batman with the Bat-Signal. Billowing smoke and wind reveal Batman as he’s called into battle onto the rooftop, ready to save the world. Harness your inner Super Hero alongside Wonder Woman. One successful gauntlet blast can destroy LexCorp’s technology that has created havoc in the city. Help The Flash by running alongside him! Once you hit ‘top speed’, effects around The Flash’s environment, including projection lighting on his suit, jump to life and electricity cracks. Take your Darling Harbour adventure to all new heights, courtesy of the Star of the Show Ferris Wheel that has extended its stay and will now be in residence until February 2019. Located in the Harbourside Amphitheatre, the Ferris Wheel showcases simply spectacular 360-degree views of Darling Harbour, the waterfront and Sydney. At over 32-metres in height, the Star of the Show Ferris Wheel claims the title of the highest continuously travelling Ferris Wheel in Australia, and is open day and night. From now until October 25, the National Maritime Museum is exploring the influence and impact of the humble shipping container with an open-air exhibition entitled The Box that Changed the World. This bright and colourful display sees containers scattered like Lego boxes in the museum’s first outdoor installation and looks into how container shipping has shaped our modern world, changing how we live, work, eat, produce and shop. Seen and recognised worldwide, it’s easy to take the shipping container for granted. But some say this unassuming box has done more for global trade than all of the international trade agreements signed over the last 50 years together. Featuring over 100 spectacular images of nature in her infinite glory, the 53rd Wildlife Photographer of the Year exhibition showcases the truly awe-inspiring work of the world’s best wildlife photographers. On loan from the Natural History Museum of London, the display celebrates the diversity of the natural world and features inspiring stories of conservation, surprising animal behaviour and hidden underwater worlds. Winning images were selected for their creativity, originality and technical excellence. The competition first launched in 1965 when it attracted 361 entries. Today the competition receives almost 50,000 entries from 92 countries, highlighting its enduring appeal. Marvel at playful seals, be mesmerised by a cunning arctic fox and embrace the wonder of nature. Discover 100 extraordinary, award-winning images from one of the world’s most prestigious photography events. Direct from the man who brought us Titanic is a new exhibition from James Cameron that showcases his history-making deep-sea expeditions. Destined to delight underwater enthusiasts, the exhibition traces Cameron’s lifelong pursuit of and achievements in deep ocean science, technology and exploration including his record-breaking dives in Deepsea Challenger, the submersible vessel he designed that was built in Sydney. Visitors will experience how Cameron’s drive and passion for understanding and exploring our oceans has shone a light on the spectacular phenomena and mysteries of the least known place on earth and enabled maritime archaeologists to document and understand the shipwrecks of RMS Titanic and the German battleship Bismarck. The exhibition immerses visitors into an underwater environment using cinema scale projections, artefacts and specimens from his expeditions; displays of artefacts from the design and construction of the Deepsea Challenger; underwater recording, lighting, communication and diving technologies pioneered by Cameron; and props and costume from the feature films The Abyss and Titanic made possible by his drive to understand and expertise in meeting the challenges of the deep. Action Stations offers a new and exciting way to experience the compelling history of the Royal Australian Navy (RAN). Action Stations reinterprets and enlivens the Australian National Maritime Museum’s much-loved ex-RAN vessels- HMAS Vampire, HMAS Onslow, and HMAS Advance. Featuring a dramatic immersive cinematic experience, a new discovery and exploration space and audio-visual encounters that recall sailors’ memories on board the vessels, Action Stations will give visitors new insight into the inner workings of navy life at sea. New projections, soundscapes, lighting and music will awaken you to the very real dangers faced by a naval crew. On October 7, Tumbalong Park in Darling Harbour will play host to a celebration of Lebanese culture with the annual Lebanon Carnival. This year the event marks its 40th year and features a host of incredible performers showcasing the cultural history and modern day influences on traditional Lebanese culture. 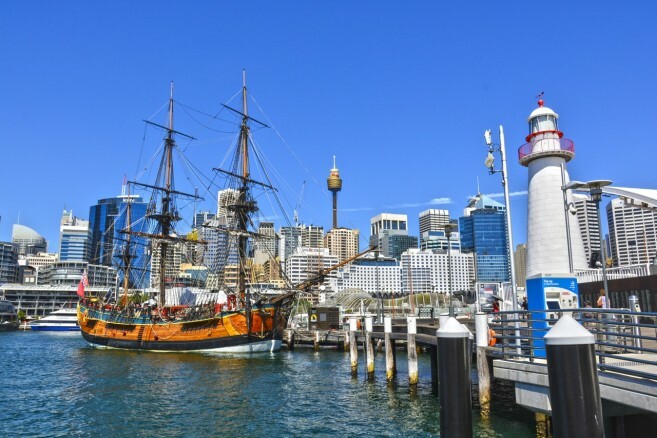 Since Australia’s Bicentennial in 1988, Darling Harbour has boasted an ever-increasing range of tourism icons, weekend events and ongoing activities. As one of Sydney’s cultural melting pots, it showcases the history and vibrancy of this exciting city. In addition to a host of permanent attractions, Darling Harbour also features an ever-changing line-up of events and exhibitions, making this a destination that can be enjoyed time and again. Sea Life Sydney Aquarium – Sea Life Sydney Aquarium is one of the city’s biggest and brightest attractions. You can walk through large glass tunnels as sharks swim lazily by (and overhead!) and marvel at the vast array of rays and tropical fish. Wild Life Sydney Zoo – Tucked into a corner of Darling Harbour, this zoo is deceptively big. The space is divided into natural Australian habitats, such as the tropics, desert and rainforest. Here you can meet and greet koalas, and see wallabies, kangaroos, wombats, lizards, snakes and Rex, the resident crocodile. Madame Tussauds – Like its international counterparts, this iconic attraction is home to a range of lifelike wax statues, with local favourites such as Hugh Jackman and Nicole Kidman among the famous faces. Chinese Garden of Friendship – The perfect place to truly relax, the Chinese Garden consists of a series of meandering paths and arched bridges crossing serene ponds filled with golden fish. You can rest in a number of small pavilions by the water’s edge, or enjoy a tea in the traditional Chinese teahouse. Harbourside – Harbourside is a multi-level shopping centre where you can find great bargains amongst designer clothing, shoes, arts, crafts and homewares. Australian National Maritime Museum – One of our favourite museums, this is a great option for families or anyone with an interest in history. There are plenty of large exhibition spaces to explore, then step outside to discover a variety of moored vessels including vintage yachts, a submarine, a warship, and beautifully restored tall ships from the 18th Century. Located on the King Street Wharf amidst the beauty and excitement of Darling Harbour, George’s Mediterranean Bar and Grill is renowned as one of Sydney’s premier eateries. Come share the Greek hospitality for which we are renowned as we serve up harbourside dining in simply stunning surrounds. You can learn more about our function facilities here, or contact us directly for further advice. Get offers, events, and news sent straight to your inbox!